The word ‘archives’ tends to evoke the image of filing cabinets and systems of classifaction. So too does the project Double Bound Economies. This project has been developed from a concrete body of material: an archive of 19,500 photographs from the German Democratic Republic, that can be found on films in medium format under archive numbers, dates, titles and in boxes. They document in one part workers in people-owned factories in the GDR, and in the other part international delegations (from Angola, Mozambique, West-Germany, Soviet Union, Sweden, et al.) at the Leipzig Trade Fair during the period of socialism until its collapse around 1990. Nineteen thousand five hundred photographs. International trade. GDR. The sheer flood of images is enormous. All possible categories of analysis fail here, and attempting to establish a linear ordering system offers only a superficial observation. A straightforward concatenation of arguments would veil a labyrinth of paradoxes since each reading of the archival body unfolds a different narrative that might contradict with the previous or subsequent one. Examining Double Bound Economies, a research and exhibition project by the group PRODUZIEREN (founded by Estelle Blaschke, Armin Linke, Doreen Mende in 2011), discloses a spectrum of knowledge. 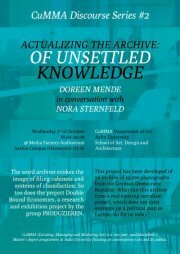 This talk will focus on what Mende called an unsettled knowledge, which emerges from contradicting voices, paradoxes and antinomies. The unsettling emerges from a “micro-political potency” (Suely Rolnik) which may have rested over years, but it is retained like sediment in those bodies that are vulnerable to their institutional surroundings. Its creative potential lies not in retreat, not in nostalgia, and not in suffering, but in that acute desire to give language to the feelings of discontent and alienation from the governing system. From here, we may pose the question: What can this archive from a real existing socialism project, which does not exist anymore on a political map in Europe, do for us today?